One of Oxford’s oldest colleges, Balliol College dates back to the 13th century, although the precise date is disputed. The architecture of this rambling college is predominantly from the 19th century, though parts of the Front Quadrangle are as old as the 15th century. It takes its name from its founder, John de Balliol. 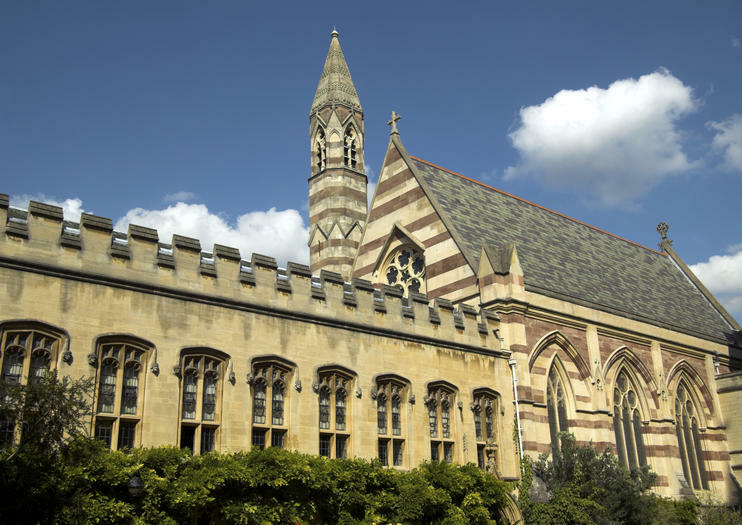 There is a small charge to enter Balliol College, which gets you access to the Victorian-era chapel, the gardens, and sometimes the dining hall. As Balliol is architecturally less spectacular than colleges such as Christ Church and lacks the literary connections of, say, Merton, it’s not an especially common destination for organized Oxford walking or cycling tours, most of which stop at the frontage rather than exploring within. Most travelers visit independently, while exploring central Oxford on bicycle or foot. Balliol College is especially of interest to travelers with a curiosity about British politics. Avoid looking through windows, especially during term: Students and academics live and work here. There is wheelchair access to much of the ground level at Balliol College, but you will need to advise the porters ahead of time. Balliol College is located in central Oxford, on the corner of Broad Street and St. Giles. Almost everyone explores Oxford on foot, or perhaps by bicycle, and it’s generally easiest to arrive by train or bus. Most London trains start from Paddington, while the popular Oxford Tube coach service stops at Victoria, Shepherd’s Bush, Notting Hill Gate, and Marble Arch. Drivers typically leave their vehicles in park-and-ride zones outside the city. Balliol College is open to visitors from late morning until late afternoon, or dusk, whichever comes sooner, but closes occasionally for college events. Like other Oxford colleges, it can get very busy during the summer months, particularly on weekends. Plan to visit during shoulder seasons, and/or earlier in the day, for a better experience. Balliol College has an impressive roster of alumni, particularly in the turbulent field of British politics. Authors including Graham Greene and Aldous Huxley studied here, along with three British prime ministers, the controversial politician Boris Johnson, and intellectuals such as Richard Dawkins, John Evelyn, and John Wycliffe. Escape the city for a sojourn in the British countryside on this full-day tour of Oxford, Stratford and the Cotswold Villages from London. Visit the birthplace of William Shakespeare and Ann Hathaway’s cottage in Stratford-Upon- Avon, then drive through the idyllic Cotswolds, stopping to snap photos of the thatched-roof cottages and historic villages along the way. Finally, enjoy a walking tour of Oxford and discover the ‘City of Dreaming Spires,’ home to the oldest university in the English-speaking world. If you’re interested in Oxford’s rich history, look no further than this 1.5-hour walking tour for a comprehensive overview of the historic city. In a small group limited to 15, you’ll visit Bodleian Library and Christ Church College—home to Harry Potter filming locations—and learn about Oxford University alumni such as CS Lewis and JRR Tolkien. Plus, receive a ILoveOxford Savings Card. This card is accepted by 50 local traders and will easily save you money all over town in cafes, shops, and restaurants.